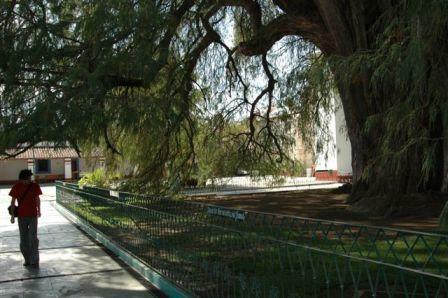 El Árbol del Tule (Spanish for The Tree of Tule) is a tree located in the church grounds in the town center of Santa María del Tule in the Mexican state of Oaxaca, approximately 6 miles east of the city of Oaxaca on the road to Mitla, the location of some interesting Zapotec and Mixtec ruins. It is a Montezuma cypress (Taxodium mucronatum), or ahuehuete (meaning "old man of the water" in Nahuatl). It has the stoutest trunk of any tree in the world. In 2001 it was placed on a UNESCO tentative list of World Heritage Sites. It is considered by many too be the largest tree in the world. In 2005, its trunk had a circumference of 137.8 ft, equating to a diameter of 46.1 ft, a slight increase from a measurement of 37.5 ft in 1982. However, the trunk is heavily buttressed, giving a higher diameter reading than the true cross-sectional of the trunk represents. The height of the tree is difficult to measure due to the very broad crown. The 2005 measurement, made by laser, was 116 ft. All I can say is that it is definitely taller and wider now in 2017 than when I first saw it in 2007. It’s also healthier looking than ever. It is so large that it was originally thought to be multiple trees, but DNA tests have proven that it is only one tree. This does not rule out another hypothesis, which states that it comprises multiple trunks from a single individual. The age of the tree is unknown, with estimates ranging between 1,200 and 3,000 years, and even one claim of 6,000 years. The tree is nicknamed the "Tree of Life" because of the images of animals that seem to be part of the tree's gnarled and burled trunk. As part of an official project local schoolchildren give tourists a tour of the tree and point out shapes of creatures on the trunk, including jaguars, elephants and alligators. This tree was a sapling at the time when the civilization at Monte Alban was flourishing. In addition, the tree is symmetrical and very healthy although that hasn’t always been the case. Some years ago the main road ran right beside the tree. The heavy traffic and vehicle exhaust caused the tree some serious health problems. The road was rerouted and the ground under the dripline was protected with a metal fence and now the tree is flourishing again. 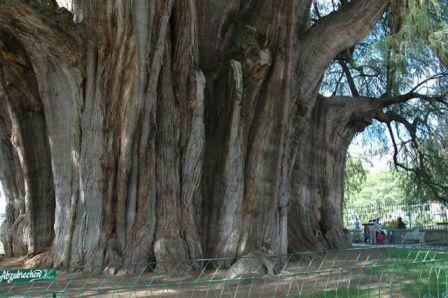 It is Mexico's most famous tree and some say the world's largest single biomass. 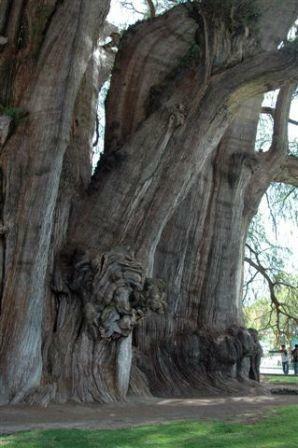 The cypress, known in Spanish as ahuehuete, is Mexico's national tree. According to legend, Hernan Cortes cried beneath the boughs of a cypress after the Aztecs defeated the Spanish on La Noche Triste (The Sad Night). 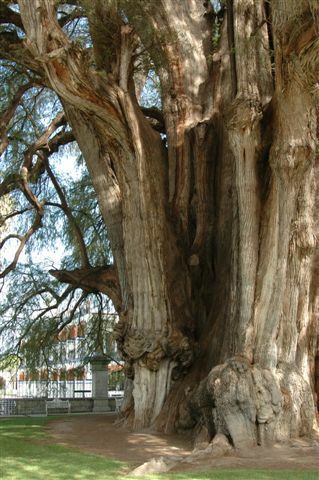 The town of Santa Maria del Tule takes its name from the famous tree and boasts not just one, but seven extremely large and ancient cypress trees. 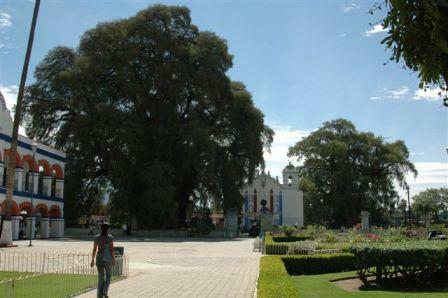 The “Son of Tule” is a gigantic cypress and is on the right of the church. Son of the biggest tree in the world - 1000 years old. 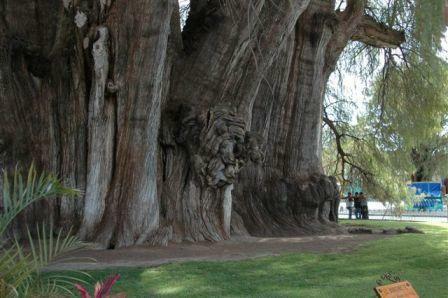 The Tree of Tule dwarfs the town's church, is more than 2,000 years old and is still growing. Its weight is almost 550 tons, its volume is 705 cubic meters and it has a diameter of 42 meters. 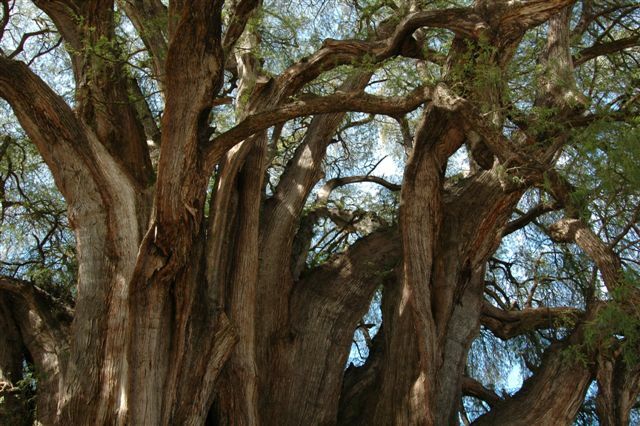 Local residents celebrate the famous Tule Tree with a grande fiesta every October 7th. This tree is the inspiration for "The Tree of Life" in Disney's Animal Kingdom, a massive fourteen story (145 ft.) tall artificial tree with carved images of 325 animals. Largest living organism on earth: The largest living organism on earth has been discovered in the Malheur National Forest in eastern Oregon. A fungus living three feet underground is estimated to cover 2,200 acres. After testing samples from various locations, scientists say it is all one organism. To enjoy the most recent video on the Tree of Tule and other wonderful member benefits, join the Organic Club of America. Click here to Join Now.